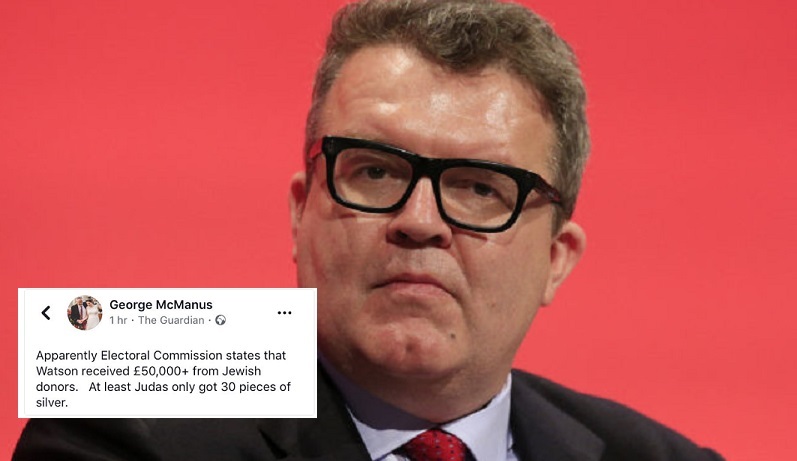 A Labour Party activist has been swiftly suspended for comments he made on social media about MP Tom Watson claiming he was in the pay of “Jewish donors”. But although George McManus withdrew and deleted his Twitter comment, made on Monday, and apologised to Watson, he was nevertheless suspended hours later. 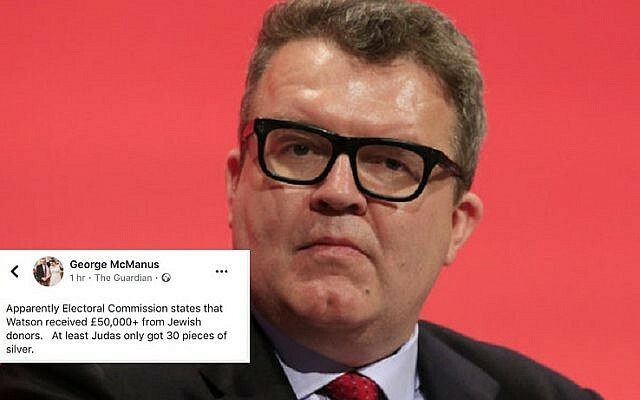 McManus, who is said to have been backed by Momentum and was standing for a place on Labour’s National Policy Forum, tweeted that the Electoral Commission had stated that Watson had received “£50,000+ from Jewish donors”, adding “at least Judas only got 30 pieces of silver”. The comment was immediately made the subject of an official complaint by Watson’s colleague, Luciana Berger. She and other MPs, such as Wes Streeting, denounced it as anti-Semitic. Momentum founder Jon Lansman also decried the McManus tweet as anti-Semitic. It appears to have emanated from figures on the Electoral Commission website showing donations to Watson’s office from Sir Trevor Chinn. But Lansman responded: “Do you not realise that Trevor Chinn is associated with the most progressive Jewish causes and charities like the New Israel Fund and Yachad! Your assumptions about Jews’ political attitudes are I am afraid anti-Semitic”. He later deleted this tweet. McManus apologised online to Watson, who was subjected to a barrage of hate mail on social media at the weekend after he appeared to clash with party leader Jeremy Corbyn about how Labour should deal with antisemitism. He wrote: “I’d like to apologise to Tom Watson for my drawing an analogy between accepting money from Jewish donors and the biblical story of the betrayal by Judas. Streeting, deploring the original tweet, wrote: “More from the cesspit. This isn’t even subtle. This is 100 per cent a classic anti-Semitic trope”.